George Sandy is a Northern California activist. In 1992 George Sandy, past president Congress of California Seniors, Oakland, endorsed the Committees of Correspondence national conference Conference on Perspectives for Democracy and Socialism in the 90s held at Berkeley California July 17-19. Seniors Seniors and the struggle for radical social reform. What role for the left in their movement for health care, economic security and racial equality? 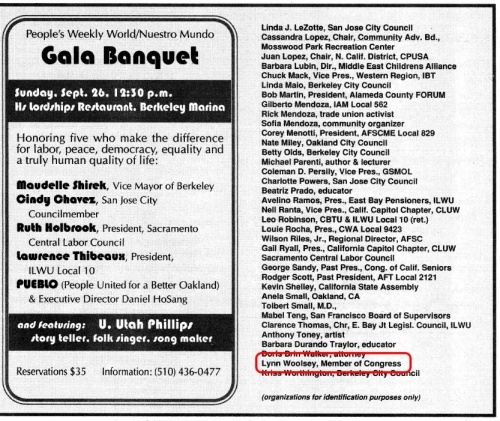 In September 1999, George Sandy, Past President, Congress of California Seniors, co-sponsored a Communist Party USA fund raising event in Berkeley. Rep. Lynn Woolsey co-sponsored the same event. May Day greeting was included in the Special May Day 1999 Supplement of the Communist Party USA's People's Weekly World. Greeters included George Sandy. This page was last modified on 2 January 2016, at 17:01.